Sometimes I eat chocolate chips for lunch. Sometimes after a period of eating random bits and pieces of food-that-isn’t-really-food for lunch, my personal trainer/aspiring dietitian self decides that I should act like a grownup and actually plan, prep, and cook food to have on hand all week for lunches. Planning is key for me to stay on track. 1. It needs to be portable and not require heating in the event that I am spending the day studying somewhere, or going between the gym and home throughout the day. 2. It needs to be delicious. I get bored easily. 3. It needs to have a substantial amount of nutrients (protein, healthy carbs, healthy fat, vitamins). A basic salad is going to leave me hungry and make it harder to resist treats. Like chocolate chips. 4. The prepping and cooking needs to be simple enough that I will actually do it. 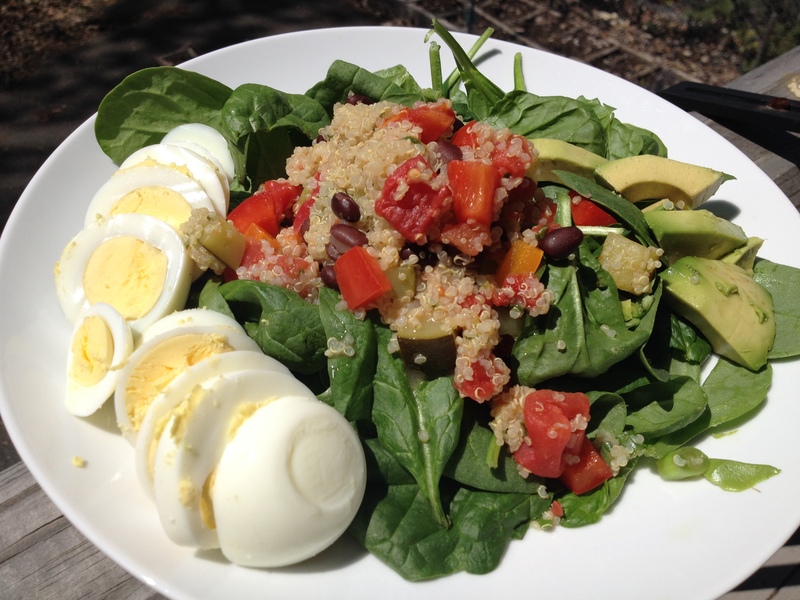 Solution: Quinoa and black bean salad, baby spinach, hard-boiled eggs, and avocado. Here is the salad recipe from Moosewood Low-Fat Favorites. I am posting it in its original form, but I also added zucchini to mine because I had some left in the fridge. This is a good way to use up veggies that you have on hand. Rinse the quinoa in a sieve. Using a medium saucepan, bring the water to a boil, add quinoa, cover, and simmer for 10-15 minutes. All of the water should be absorbed. Allow to cool. Combine the oil, lime juice, cumin, coriander, cilantro, and scallions in a small bowl. This is important so that the spices are distributed evenly. Add the beans, tomatoes, bell peppers, chiles, cooled quinoa, and salt and pepper. I had this salad on its own, in the larger salad that you see above, and as part of a breakfast burrito. While I like the recipe overall, I think that it could use a little boost. I would recommend increasing the spice amounts if you are someone who likes a lot of flavor. I have come to some conclusions recently. Conclusion #1: I need to post on here once in awhile. I had dinner with some food bloggers, some of whom post something every day! I should be able to handle posting at least every couple of weeks….right? Conclusion #2: I am crazy. My husband says so, and I can’t disagree. The recipe below calls for crushed baked tortilla chips, so what did I do? I made my own tortillas, baked them, and then crushed them. What could have been a 45 minute dinner took me twice as long. Hopefully you are saner than I am. If not, see here for tortilla making instructions. This recipe for Black Bean Chilaquiles from Moosewood Restaurant Low-Fat Favorites is one of my favorite dinner recipes. You could easily alter the recipe to use different vegetables, add in meat in place of (or in addition to) the beans, or use a different kind of cheese. Preheat oven to 350. In a large frying pan, heat oil over medium heat. Add onions and saute for about 8 minutes, or until onions are translucent. Add in black beans, corn, tomatoes, lime juice, salt, and pepper. Cook for 5-10 minutes or until heated through. In a large pot, bring water to a boil. Add in chopped greens and cook for 1-3 minutes. Immediately drain and set aside. Lightly spray an 8×8 dish with cooking spray or oil. Layer 1 cup of crushed tortilla chips in the bottom of the dish. Spoon the black bean mixture over the chips and top with about 2/3 of the cheese. Spread the chopped greens evenly over the cheese. Spread 1 cup of salsa over the greens, then top with the remaining 1 cup of chips, 1 cup of salsa, and remaining cheese. Cook for 35-40 minutes or until cheese is bubbly. The slice doesn’t really hold together on the plate, but it still tastes good!